Some hazards are preventable. For compact track loaders, debris and dust are the two most dangerous. Eliminating these offenders simply calls for some attention to detail around the machine. How often preventive maintenance needs to be performed largely depends on the environment the compact track loader is operating in. For instance, a forestry application will create much more debris than landscaping. Here is a look at the biggest hazards on the jobsite, how to thoroughly clean a compact track loader, the extra care needed for high-flow compact track loaders and some common mistakes to watch out for. Machines that aren’t regularly cleared of debris and dust can experience expensive failures. Debris such as leaves, mulch, grass and others can build up inside and around the compact track loader, which can overheat the engine and hydraulic components due to insufficient air flow and clogged coolers. Debris covering exhaust components can also raise concerns and increase the chance of even bigger issues. In extremely dusty applications like demolition, the engine air filters and cabin air filter should be checked regularly. When cleaning a compact track loader, the operator should find a safe area to park and allow the engine to cool down completely. With proper safety equipment on, start at the rear of the machine. Remove all debris from the deck before opening. Raise the rear deck lid and open the rear door. Remove the two bolts from the cooling module, which allows it to swing out to access both sides. Install the pin to hold the cooling module in place and remove the outboard battery access panel. Using compressed air, thoroughly clean both sides of the cooling module, fan area, battery compartment, engine and the air conditioning condenser core. Next blow out the rear towers, lift the cylinder area and the side air intake screening area located close to the operator’s station. Lastly, the operator can address the belly of the machine. Remove the three belly pans and two cab bolts. Lift the cab and install the safety pin on the rear deck. Depending on material, use either compressed air or water to clean out all accumulated debris and combustible materials from inside of the machine’s belly pan, as well as areas in proximity to the engine, fuel and hydraulic oil systems. Perform these steps as often as necessary — daily or weekly. Monitor debris accumulation and make the best judgment from there. Be proactive, not reactive. High-flow machines require the same checks as standard compact track loaders. However, high-flow units are typically involved in more forestry applications where proper machine cleaning needs to be performed more frequently. These models tend to run high-flow hydraulic attachments which can increase hydraulic temperature and decrease the lifespan of the oil. On these models, ensuring the radiator and oil cooler stay clean is vital to a healthy hydraulic system. Increased hydraulic oil change intervals may be necessary, so frequent checks of the hydraulic system should be performed. Mistakes happen, but avoiding them when possible saves money, time and potential injuries. Here are some pitfalls that, if ignored, can add up to expensive fixes. Belly pans: By not performing regular cleanings on the belly pan, it will result in accumulated dirt, mud and debris around the hydrostatic pump group. This will inhibit the heat that is generated from escaping, and the excessive hydraulic temperature will impact the engine temperature as the oil cooler is right next to the radiator. Hot shutdowns: This happens when the machine is done working under a load so the engine and exhaust temperatures are extremely high. Turbocharger-equipped engines need to idle until the exhaust gas temperatures drop, supplying cooler oil to the turbocharger. Otherwise, the turboshaft will continue to spin in extremely hot residual oil, damaging the turboshaft and bushing, which could result in future turbo failure. Filters: If dirty, these should be replaced, not cleaned. Using compressed air to blow the filters out will damage them and allow dirt ingestion, resulting in engine damage. Cold climates: In cold climates, the operator should warm up the engine and allow the engine oil to circulate prior to increasing the rpm. This is good practice even at higher ambient temperatures to ensure proper oil pressure prior to rpm change. A quick look at machine cleanliness, fluid levels, air filter cleanliness and more can save the operator from catastrophic equipment failures. Overall, daily checks in and around a compact track loader machine are a must. These easy checks can be the difference between a simple preventive maintenance measure and a failed engine. 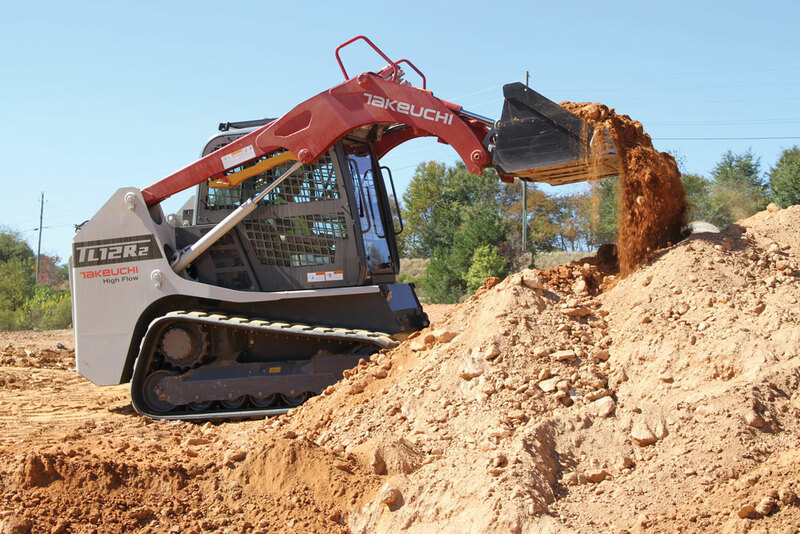 Keith Kramlich is the national service and warranty manager at Takeuchi-US.